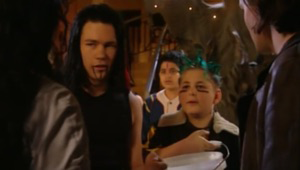 KC is an original member of the Mall Rats, and first appears in series one episode twenty two. KC can best be described as the character 'The Artful Dodger' from Charles Dickens novel 'Oliver Twist'. KC is a streetwise kid who will con, cheat, steal, lie to get anything he wants. Even with all these faults KC is not without honor, and is loyal to the Mall Rats. 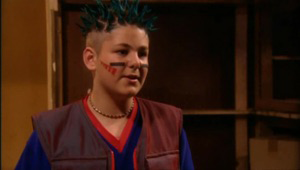 He is a lovable character whose skills get him and the tribe into big trouble sometimes, but they also save the tribe as well. Over the course of the series KC grows up and learns how to use his skills for the benefit of himself and the tribe. Usually a new tribe member is introduced to the tribe, and they enter through the front entrance of the mall. In 'Artful Dodger' style KC comes in through the sewers, and manages to load up his bag full of the Mall Rats possessions. About to leave KC is caught by Lex, and brought before the Mall Rats. Some of the Mall Rat's want to throw KC out and others want to lock him up. Lex suggests KC be allowed to stay as his skill's might be useful, and so they can keep an eye on him, and not have to worry about their items disappearing again. The tribe agrees and KC becomes a Mall Rat. KC becomes friends with Lex who becomes his big brother and mentor. Like Lex KC cannot read, and refuses to do housework, or learn anything. In series one KC makes friends within the tribe, and helps with the wind turbine. KC goes to a casino, and ends up leading Tribe Circus to the mall. The leader of Tribe Circus Top Hat tries to have his way with Zandra, and KC saves her from Top Hat. Amber goes off on KC for causing trouble at the mall as a way to blow off steam from losing Bray. Amber leaves to search for Bray, and finds the Loco headquarters. Dal cheers up KC, and KC accidentally guesses the code for the Hope Island files. Jack and Dal realize that the formula they have seen is actually coordinates for Eagle Mountain. Jack tries to persuade others to go there, but they have their reservations regarding Jack's hunch. In the end all the Mall Rat's make the long trip to Eagle Mountain. 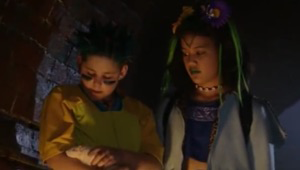 In series two the Mall Rat's find the antidote, and pass it out to the other tribes until it is all gone. Later in the day the mall is filled with angry people looking for the antidote, so KC and Lex make a fake antidote to get them to leave. Later it is discovered that Tai-San knows how to make the antidote, and so the Mall Rat's start producing it. Always seeing an opportunity KC starts collecting stuff from the sick kids in line. Bray is shocked when he finds KC taking stuff from the sick kids and decides to punish him by letting him do all the dirty work on the farm. KC is back to his old tricks, and becomes worried when Patsy sees the pictures of Tai-San's lab, but Patsy decides to keep quiet if KC agrees to do whatever she wants. KC brings Lex the pictures, and they set off on another mission. They lure Alice away from the lab while KC takes time to check the lab. Tai-San is angry to learn that Alice allowed KC to watch over the lab. KC enters the lab and sets off the gas. Alice smells gas, and tries to warn Tai-San, but it's already too late. An explosion rocks the lab, and Tai-San loses her memories. Patsy runs away from the mall after losing Brady. KC finds Patsy, but she refuses to return to the mall, and threatens to reveal KC's secret. KC confirms to Ebony that he caused the explosion, and asks her to protect him from Alice in exchange for information on Patsy's whereabouts. Ebony manages to turn the situation around, and get what she wants. Lex suggests KC should tell the truth. KC finally confesses his crimes, but gets off without a punishment after Tai-San finally regains her memory. KC overhears Spike talking about revenge on Ebony, and he informs her about it. The tribe realizes that Ebony is missing, but nobody cares enough to worry. KC refuses to admit that he knows where Ebony might be. KC and The Hunga strike a deal. Cloe, Patsy, and KC play around by seeing how long Jack and Ellie can make out. Alice uses a scary technique to force KC to reveal where Ebony went. KC storms into the mall with news of a huge group of people coming to confront them. Bray attempts to reason with the crowd, but ends up hurt instead. The crowd enters the mall, and is about to attack the Mall Rats when Ebony finally steps out, and confronts them about acting disgusting. She tells a wonderful story about how much the Mall Rat's have risked to save the lives of every person, and the crowd finally settles down, and applauds Ebony. The Mall Rat's set up a trading-post, and Lex and KC buy up all the batteries creating a shortage they profit from until the Mall Rat's put a stop to it. Always the operator KC comes up with a plan on how to win money using rats. KC and Cloe disagree over the rat racing, so Cloe decides to train her own rat, and beat KC. At the rat race, KC's plan to drug other rats goes wonderfully until his rat ends up disappearing. Cloe's rat takes his place, and ends up winning. KC wants protection from Ryan, but Ryan declines after learning it's because he's in debt. Later Ryan saves KC from getting chased by the people he owes money, but then unleashes his anger on KC. In return for saving him KC helps Ryan find an engagement ring. 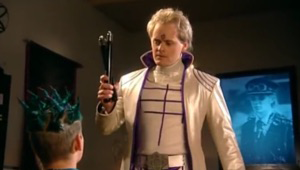 In series three KC convinces the Guardian he has seen Zoot, and becomes his oracle. Later KC has a crush on May and is hurt when she rejects him. 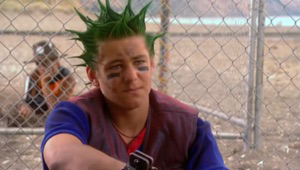 When Cloe comes back, he develops a crush on her as well. KC disappears with the others when the Technos invade. KC is seen at the end of series five, on some unknown island. He along with Alice, the Guardian are held prisoners in a cage. KC was also written into the cancelled series six. 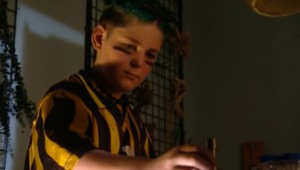 KC had few outfits throughout his time on the show, when we first see him, he wears a striped yellow and black football shirt, with the number nineteen on the front. He also wears a pair of navy blue pants, with patches of red and grey, at the bottom of both legs. When KC goes outside he is seen with a leather jacket with a woolly white colour collar, and a dark green hat with eyes sewn on the top. 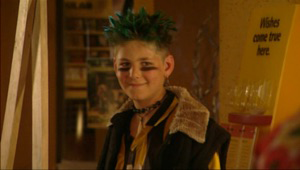 His hair is styled green and spiky and his face paint is simple black lines smeared under his eyes. His series two outfit is a orange top with a green square at the front and the collar is coloured light blue, to a dark blue with a bright green. He also wears a blue set of pants, with various coloured strips down the sides of the legs, and a leather vest jacket that zips up at the front. 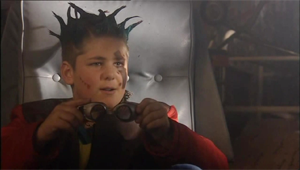 His face paint is much the same as in series one just with a green line and a tint of blue, together. His Series three outfit, is a blue top with a red line marking the collar. A dark red vest, with two front chest pockets, and a red zipper that does up at the front. He also wears a pair of jeans with a patch covering his right knee. A chain necklace is worn with this outfit.